This report is the collective product of the Transportation Committee supported by the Cuban-American Association of Civil Engineers (CAACE) and the Asociación de Ingenieros Cubanos (AIC). The Transportation Committee is composed of Sergio Alfonso, Jr., Chair; Carlos A. Penin, Co-Chair; Armando I. Perez, CAACE Member; Maria F. Porrata, CAACE Member; Michael B. Acosta, AIC Member; Pedro Giralt, CAACE Member; and Andrés Garganta, CAACE Member. The findings, views, opinions, and conclusions presented are those of the Transportation Committee and do not necessarily represent those of their employers or sponsoring engineering societies. This report describes the Cuban transportation system as it existed in 1958, investigates and assesses the present transportation system, and puts forth an approach to repair and restore the transportation system. The goal is to assess the present system, identify and categorize the necessary resources to reconstruct the transportation infrastructure in Cuba, given information that was available through the internet and other resources. Ideally this work should be supplemented with field reviews and inspections. The highway system evolved from 250 kilometers (km) of paved roads in 1903, mainly in Havana Province, to 20,000 km throughout the island in 1958, of which 6,100 km were paved. By 1958 Cuba had one of the most efficient highway systems in Latin America. The main highway was called, the “Carretera Central” (Figure 1). This is a two-lane two-way highway, the backbone of the island mainly along the drainage divide running approximately 1,150 km. The main highway approaches the coast only at three places (Havana, Matanzas and Santiago de Cuba), basically paralleling the central railway. This road runs from Pinar del Rio to Santiago de Cuba connecting all province capitals and all major cities except Cienfuegos. Construction began in May 1927 and was completed on February 24, 1931. At the time of construction, it was ahead of its time, well planned and constructed; there was no rail-highway at grade crossing. All railroad crossings are grade separated. It has a width of 6.3 meters in rural areas and 8.09 meters in urban areas through towns and cities. The Carretera Central was constructed by two companies: Associated Cuban Contractors and Warren Brothers Company of Boston, Massachusetts, at a cost of $75,870,000. They both had to guarantee and maintain the highway for a period of five years. The Via Blanca is a four-lane divided highway running from Havana to Matanzas and into Varadero. 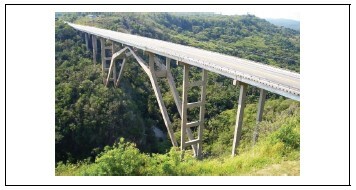 It is approximately 135 km long and includes the Bacunayagua Bridge, the highest bridge in Cuba (Figure 2). There were approximately 4,000 km of secondary roads connecting all cities and towns with population exceeding 5,000 to the Carretera Central. In addition there were 15,000 km of local roads (Caminos Vecinales) of which 1,500 km were paved. These local roads connected farms to small towns and were used to transport produce from the farms to towns and cities. Cuba’s railway history began in the 1830s when Compañía de Caminos de Hierro de La Habana built a 27 km line from Havana to Bejucal. In February 1859 the city of Havana had its first streetcar line managed by Ferrocarril Urbano de la Habana. By 1958, Cuba had 15,000 km of railways throughout the Republic. The Central Railway, standard gauge (1.435 meters), was in operation since 1902 providing passenger service between Havana and Santiago de Cuba. Narrow gauge (1.067 meters) lines represented 64% of the total rail system in Cuba; narrow gauge lines were mostly owned and used by the sugar industry. Cuba’s public transportation system consisted of passenger services available for use by the general public. These consisted of buses, rail, airlines, etc. Buses: Omnibus Aliados, the company serving City of Havana public transportation had 4,000 buses serving 40 routes. At peak hour, the typical headway was three minutes. 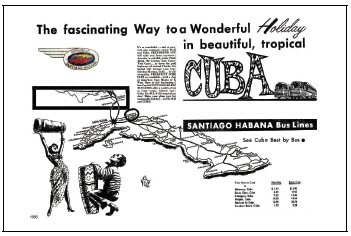 The interprovincial service was provided by various companies; Santiago-Habana (Figure 3), the best known, had ten daily trips from Havana to Santiago de Cuba with stops at major cities. 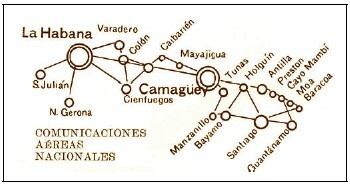 Omnibus Camagüey also provided Havana to Santiago de Cuba service. There were also numerous additional bus services providing connections from major cities along the Carretera Central to small cities and towns. Rail: The City of Havana had street car service until 1950. There was passenger and freight service from Pinar del Rio to Guantánamo since 1903 using the central railway system. Airlines: There was air service between major cities and provincial capitals served by Cubana de Aviación and other smaller airlines (Figure 4). Since 1959, insufficient capital investments have been made in Cuba’s transportation systems. The lack of investment has only accelerated since the collapse of the Soviet Union and the loss of multibillion dollar annual subsidies Cuba received. This lack of investment and maintenance are reflected in the deteriorated condition of the transportation system. The present government has constructed new roads and highways, such as Ocho Vías, Circuito Norte y Sur and Santiago-Baracoa connector. Presently, there are 60,000 km of roadways of which 20,000 km are paved. The Ocho Vías, constructed from Havana to Santa Clara in Las Villas Province, intended to replace Carretera Central. It was originally proposed to be an eight-lane divided super highway (Figure 5). Although it has eight lanes within Havana Province, the lanes are reduced to four when it reaches Santa Clara. According to a November 2007 EFECOM report, nearly 3,000 km of major roadways are in poor or substandard condition. The same report goes on to indicate that planned repairs would not amount to even 400 km per year. A March 2009 report in the Latin American Herald Tribune quotes the director of the Havana Government’s Business Construction Group for the city’s streets and roadways, as indicating that over 75% of paved roadways in the Havana area are in poor condition and need “big and complex” repairs. The Cuban capital has approximately 21 million square meters of paved area and the effort of repaving the existing damages will require 1.5 million tons of asphalt. Several international travel guides report that “…there are few regulatory road signs and directional guide signs” and “missing pavement markings, protective crossbars or warning lights at railroad crossings.” Additionally, “roads are similar in construction to U.S. highways, however, much in decaying state. This means no signs for cities on exits and interchanges, only counting km’s to Havana are common. Potholes on freeways are frequent.” In 1959 Cuba had one of the most extensive road networks in Latin America. Since then further expansion has been undertaken, although road maintenance has decreased significantly. The present railway system is 8,193 km in length; this is a reduction of 45% from 1958. The present government removed most of all narrow gauge railways. There are 7,952 km of standard gauge track, 150 km of which are electrified and presently used for passenger service. Only 241 km of narrow gauge track are in existence. There are two nationalized bus companies in Cuba operated by the government. Viazul operates a fleet of newer coaches on long distance routes primarily for tourists. Slower and less reliable service is provided by ASTRO Bus, operating with older vehicles. ASTRO mainly serves tourists and visitor seeking lower cost. In Havana urban transportation is provided by a colorful selection of buses imported from the Soviet Union or Canada. Many of these vehicles are second hand (such as the 1500 decommissioned Dutch buses, which the Netherlands donated to Cuba in the mid 1990s) and despite the United States trade embargo, American-style yellow school buses (imported secondhand from Canada) are increasingly common sights. On seven key lines in and out of the city, service is provided by camellos (“camels” or “dromedaries,” after their “humps”), trailer buses that haul as many as two hundred persons in a passenger carrying trailer (Figure 6). The camellos started to be phased out in 2008. This section of the report identifies and evaluates the resources required to restore or establish a transportation structure that will support a thriving economy and assist in interconnecting all parts of Cuba. The assessment was based in two phases, the immediate needs, within one to five years (i.e., “Short Term”), and a system that will support extensive growth well into the future, ten to twenty years (i.e., “Long Term”). All four modes of transportation, i.e., Highways, Railways, Airports and Public Transportation, are addressed. The short term solution is to rapidly and swiftly fix and restore the system to have it operate at a safe and efficient level. The time frame for this is six months to a year. Highway System: Most roadways, highways and streets are in dire need of safety improvements such as pavement restoration, including fixing pot holes, along with resurfacing to increase the life and ridability. Traffic signs need to be installed including those used for regulatory, warning, and advisory purposes. Striping and traffic control markings are faded or not existent. The placement of edge and centerlines is vital for the safe and efficient roadway network. The installation of guardrails and delineators are commonly needed throughout the highway system. Based on current roadway maintenance costs in the State of Florida, we estimate that the cost of performing these improvements on Cuba’s major highway system is $1 billion. Using the existing total 65,000 lane km, the total investment would be $10 billion. Railway System: It is imperative to promptly repair and improve the rail conditions. The main component for short term solutions is to stabilize the base and subbase and strengthen the track bed and sleepers to restore high speed operation. Safety improvements, such as warning signs and regulatory signals at grade crossing are required due to lack of proper control and/or their absence. Based on current costs in the State of Florida, it is estimated that the total investment for performing these improvements on the total standard gauge and narrow gauge rails of 8,200 km would be $500 million. Airports: Safety improvements at existing operational airports require restoration of runways and taxiways, and stripping of directional signage at ground control. Lighting of runways and taxiways needs to be evaluated for efficiencies and compliance. Similarly, terminal repairs are necessary for the management and control of passengers. Based on current costs in the State of Florida, we estimate that the total investment cost of performing these improvements at the estimated number of 12 airport facilities would be $600 million. Public Transportation: The immediate establishment of public transportation will help restore the trust and support of the general public. Launching a service of additional rolling buses, taxis and work trucks with a reliable and dependable schedule will produce the support. The consideration of alternate means of transportation such as jitneys, mini-vans and short run shuttles will ignite a cost-effective cost system. The establishment of a maintenance facility, stocked with spare parts and mechanical tools for these vehicles, is necessary to keep the system running. It is estimated that 400 new busses would be needed initially at a cost of $250,000 per bus for a total investment of $100 million. The long term system requires the study and implementation of a mid- and long-range transportation network that will support growth and strengthen the economy. The time frame for this is ten to twenty years for the mid range and twenty to thirty years for the long range. Highway System: The evaluation of the existing roadway network and projection of future needs is fundamental in developing an enhanced master plan for the island, making sure that safe, high-speed, high-capacity connections are provided throughout. Balanced mobility and economic competitiveness within all community i s the result of a well planned and implemented system. The highways, such as Circuito Norte, Circuito Sur, Ocho Vías, planned and partially built after 1959, should be brought up to current safety standards and completed. Public Transportation: The multimodal transportation system should inter-connect people and goods to the various points of interest. It leads to economic vitality and becomes the infrastructure backbone of the island. Table 1 depicts the multimodal mode and traffic generators. Major traffic generators, population census, alignment of major highways and railways, and major airports, were used to identify hubs. These hubs will act as center point for the multimodal system. Table 2 and Figure 7 depict preliminary transportation hubs and sub-hubs. In 1959, Cuba had one of the most efficient roadway and extensive railway systems in Latin America. But the neglect and lack of up-keep maintenance of the past fifty years and the elimination of nearly 45% of the railway has created the requirement for major investment to bring the system up to standard. It was determined to prioritize the infrastructure improvement in two phases, short and long term. The short-term is based on a timeframe of one year, and the long-term was deemed as twenty years. The cost analysis was prepared by means of historical cost from Florida Department of Transportation for roadway construction in Florida. Contingency costs were included in an analysis to account for aggregate, material, plants, and other unforeseen events. As is shown in Table 3, the estimated cost of the short-term investments in the transportation infrastructure system would amount to $2.3 billion, while the long-term investments would cost an estimated $23.25 billion, for a total investment of some $25.55 billion.